The Body Pillow is especially useful to those who enjoy sleeping on their sides. 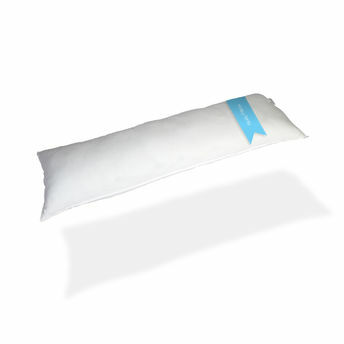 This pillow is filled with slow release, soft and silky fiber, with a special ultrasoft fabric case. The 56" long pillow is ideal for side sleepers and pregnant women as it improves posture and increases comfort for the spine, arms and legs in addition to improving blood circulation. Complimentary 300 thread count white self stripe pillow cover with every body pillow.